It had been many years since I'd had a chance to get out to this event with cameras, and it was as big as ever. A record crowd descended upon the Sears parking lot on a day with the most perfect weather. There were over 150 cars registered. Many Ford powered cars and trucks were on display from several eras, as well as some new 2011 cars on display. Oh yeah, and several Mustangs. Several more cars simply drove by or stopped for a short time. 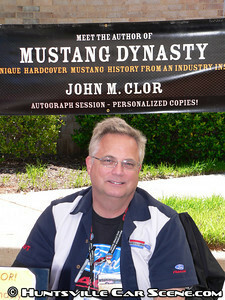 John M. Clor, author of his book The Mustang Dynasty--chronicling the history of the Mustang, was present to sign autographs and talk with fans about his experience as a journalist, a team member of the Ford Performance Group, and as a Mustang enthusiast that has been at this for decades. Mustangs from all over came to participate in the show, and a good number came from The Shoals Mustang Club. And they took home some trophies as well. Way to go! Mackenzie (I hope I spelled that right) and Brook aka 'Cookie' wanted to take some pictures with the cars. And since I had finished all my normal shots, I spent some time trying to be creative. Mackenzie takes a lot of the photos on the Shoals Mustang website so check out the pictures on their site too. It was fun shooting with you both. I hope you like the results. I just might be lurking on University about 4-4:30 looking for victims.....lol. Last edited by EvilZ; May 6th at 09:01 AM. Might not exactly be the best idea...some of those snakes can bite! I know what I'm looking for. I've already proven my car against a few Cobra's. Plus I just might have something up my sleve in the upcoming weeks. Nice! Well, be sure to spend some time looking at all the cars too. There's always nice stuff. I wonder how many sayings can be made for the various cars out there, aka, 'if a snake bites you, there's a rx for that', etc. Oh, and for those that missed the show--record turnout, great weather, lot of pictures in the works. Great show. Loved seeing all those awesome Fords out there. Especially the Grabber Blue ones. I'm going to try to publish them today. Uploading should be done in the next 2 hours, then it's time to cull. sweet cant wait to see the pics either samir!! Dodge (v.) 1. To avoid by moving quickly aside. Last edited by HDP 7; May 9th at 08:57 PM. I didn't even think about this. Just a few pixs from last weekend. Cool! I'm still working on mine. Got sidetracked by having to cover a first look at a new car by a new American manufacturer. Stay tuned...the writeup for this will be published with all the weekend's coverage. Thank you for the appreciation. It's hard work...even when it's taking pictures of pretty girls.